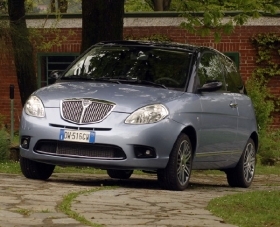 The Lancia Ypsilon will soon be joined in showrooms by Chryslers wearing the Lancia badge. TURIN – All Lancia and Chrysler brand cars sold in continental Europe will wear the Lancia badge, while the Chrysler badge will be used on all Lancias and Chryslers sold in the UK and Ireland. Lancia withdrew from those right-hand-drive markets in 1991 due to poor sales results. Fiat S.p.A., which took a 20 percent stake in Chrysler Group in June 2009, chose to predominately use the Lancia brand because consumer clinics done in Europe showed Lancias could command a higher price than Chryslers. “The Lancia brand will be most impacted by the Chrysler alliance as the two ranges will be fully integrated into a new full-liner brand,” Fiat-Chrysler CEO Sergio Marchionne said. Marchionne expects those models to help boost Lancia-Chrysler sales in Europe to 300,000 units by 2014 from 123,500 last year. In 2009, Lancia sales grew 9.2 percent to 112,000 units, while the Chrysler brand declined 60.2 percent to 11,500 units, according to the companies. The Lancia-Chrysler branding decision, announced during Fiat's five-year plan presentation Wednesday, ended months of speculation on how the automakers would market their combined product lineups in Europe. Late last year, there was talk of the Lancia brand only being used in Italy, which accounts for about 90 percent of the automaker's sales, while the Chrysler badge would be used on Lancia products throughout the rest of Europe. Then reports said Lancia would survive throughout southern Europe. Wednesday's announcement shows that Fiat expected Lancia to get stronger in Europe. Marchionne said that Lancia-Chrysler will have a combined European sales network of more than 1,000 dealerships by 2011. “This represents a perfect opportunity to leverage synergies offered on the distribution side to improve our geographic and qualitative coverage of the market,” Marchionne said. Fiat wants to move Lancia further upmarket in Europe. Right now, the Italian automaker is considered a so-called “near-premium” automaker – that means it competes against brands such as Saab and Volvo but is still well behind premium-car leaders such as BMW, Audi and Mercedes-Benz in unit sales and brand image. Chrysler also wants to move the Chrysler brand into premium territory in North America, where it would compete again brands such as General Motors' Cadillac and Ford's Lincoln.